Reader Question: Why is my cat developing bald spots? Our 18month old ginger cat has started developing bald spots around his back end, tail and back. We thought it was because he had got too big for the pet door, and was rubbing himself on it when he came in and out. But now it seems to be getting worse, and the patches are increasing, getting scabs on and around the base of his tail he has red sores. He seems happy enough, he is eating and drinking well but is looking a little thinner. I’m afraid the list of what could be causing your cat’s symptoms is very long, and I can’t really narrow it down without at least first performing an examination. The problem might be as simple as fleas (the location around the base of the tail is suspicious). Even if you don’t see fleas or flea dirt (their poop – it looks like coffee grounds), they could still be responsible. Some cats groom themselves so fastidiously that they remove all the evidence, but not before they’ve been bitten, which in some animals can set of an allergic reaction leading to symptoms like those you describe. To rule out fleas, you could try treating your cat with an effective, over-the-counter flea medication containing fipronil every month. Of course, fleas aren’t the only possibility, so are other external parasites, environmental allergies, food allergies, infections, and more. Oftentimes, the fastest and in the end the least expensive way to deal with problems like these is to make an appointment with your veterinarian. Reader Question: What is the cause of my cat having a patch of missing hair? Our cat has had 2 episodes where roundish patches of hair are missing from his coat just below the nape of his neck. I can see the skin below. This occurred about 6 months ago. He was given an antibiotic ointment & he wore a head protector. It healed and his coat re-grew the hair. Now another round patch of skin is missing. The vet did not give us a diagnosis. He is a black mixed breed-indoor cat-smooth hair-shiny black coat-male-4 yrs old. He is very active and has his sister as a companion. No skin issues occur with her. His behavior otherwise is normal. Any ideas? The list of potential causes for your cat’s symptoms is very long. To be able to narrow it down, I would have to perform a physical exam and probably a skin scraping to look for mites, a fungal culture to rule out ringworm, and skin cytology to check for infections. If your veterinarian hasn’t performed these tests yet, this would be a good place to start. None of them are very expensive or hard on your cat, and they can give your veterinarian a lot of information that would help him or her come up with a reasonable plan for treatment or any other diagnostic tests that might need to be performed. I will warn you that getting to the bottom of dermatological problems in cats is not always quick or easy. If at any point your veterinarian recommends that you see a veterinary dermatologist, it would probably be wise to do so. My cat is suffering from balding. 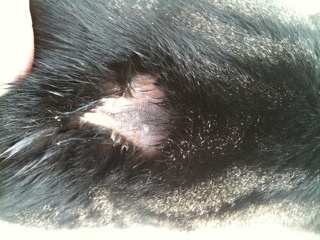 Here are her symptoms: cat has developed a growing bald spot on the base of her neck/spine. Fur comes out in clumps every few days. There is also a Black scab developing on bald spot. The cat has no other symptoms (no loss of appetite, playfulness, etc). Dermatological lesions like the one your cat has can be caused by a long list of conditions and usually require some diagnostic tests to identify and effectively treat. If your cat were my patient, I would start with a complete physical exam looking for something obvious like fleas and to get a general feel for your cat’s overall health. Next, I would perform a skin scraping to look for microscopic parasites like mites, skin cytology to rule out a bacterial or yeast infection, and pluck some hairs for a fungal culture for ringworm. All of these tests are cheap and easy to perform. Unfortunately, it can take up to three weeks to get the result of a fungal culture, so sometimes we have to start treatment without a definitive diagnosis. I often prescribe a dose of Revolution to treat for parasites that can be hard to find on diagnostic tests and a medicated shampoo or ointment depending on a cat’s personality while were waiting on the fungal culture results. If all the diagnostic tests come back negative and our initial treatment plan was ineffective, more diagnostic tests (e.g., allergy testing or skin biopsies) would be necessary. I have just 2 cats, one 9 months and one 5 months old. The 5 month old started getting like flaky dandruffy spots on his left ear, and I thought it was just from them playing. Now about 2 weeks later he has one spot of missing hair on his back and its real white flaky looking skin where the cat hair is gone just like on his ear. Some of the white dandruff looking stuff brushes off and it doesn't seem painful to him at all, but the skin is red under the white scabs that flake off like dandruff. I'm not sure what to do since it was just a small spot on his ear so I thought it might go away on its' own, but now I think I might try putting some hydraquaterzone on it or something. I'm not quite sure what to do. Thank you for your question and sorry to hear about the cat skin condition. Symptoms such as flaky dandruff over the ears indicates a mite infestation, in other words cat mange. In this specific kind of mange, called feline walking dandruff, there is some specificity which will help you in probing it out. Typical signs of this type of mange includes initial symptoms appearing at the outer part of the ear and then it spreads over the the back of the cat in a dorsal (cats back) manner. In most cases, the head and neck are amongst the most affected cat body parts. Pruritus or itchiness ranges from none to severe depending on the immune status of the affected cat. Since the infesting mites are usually very small in number, they can’t be easily isolated from the affected parts of the skin. Because of this, to test for cat mange, skin scrapings and tests for the presence of specific antibodies in the blood are required to confirm the presence of condition. Hydrocortisone, as a corticosteroid can only help to reduce symptoms such as itchiness and any rashes that may have developed. More over, let me tell you that you should not use this type of treatment on your 5 month old cat; it may cause severe side effects. You should try a combination of natural preparations, which are not only effective, but will also be safe for your cat. Try to regularly bathe your pet with a quality herbal shampoo which will clear the skin and thereafter apply some type of anti parasitic preparation such as a lime sulfur dip. A good option for both is sold by Dermisil for Pet Mange. Both together will help in the elimination of the mites. As an additional step, you can also add a natural remedy to improve your cats skin condition such as Skin and Coat Tonic. Also, as you said this condition started from the ear, so you should use a preparation made to support ear health such as Ear Dr., to deter any parasitic growth in the cats ear. Remember that natural remedies can help with limited conditions only, as in this case the infestation is limited to a specific certain area. If it spreads, a more specific mite treatment will be needed. Additionally, wash all of your cats belongings and bedding with a quality detergent mixed in hot water and disinfect all floor areas and corners of your home. Isolate the affected cat, since the other cat is at risk for mites as well that can spread from the infected cat. If you feel additional signs as pus, or lesions that spread to other parts of the body etc, consult a veterinarian for detailed examination. I have an adult cat that periodically loses hair. 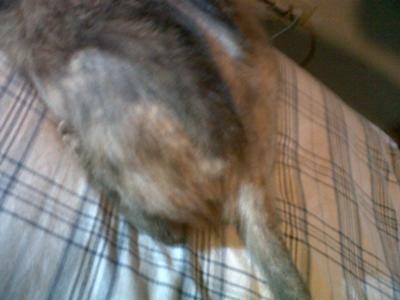 The hair loss is usually on the back and tail. My cat has no fleas or ticks. This situation appears from time to time, but is always present. Here are some pictures of the areas mentioned. If you have any advice or solution, it would be welcome. The type of hair loss you describe can be the result of a number of disorders. I know you mentioned that your cat doesn’t have fleas, but if he or she is allergic to their bites, it would only take one or two for your cat to look like this. Unless you have your cat on an effective flea preventative like Frontline or Revolution and you give it every month, I don’t think we can definitively rule out fleas as a cause. The pattern of hair loss is very consistent with fleas. So that would be my first recommendation. Try something like Frontline or Revolution every month and if your problem goes away, you know it was caused by fleas, mites, or another external parasite that is killed by these products. If this doesn’t do the trick, you’ll need to start investigating other potential causes like allergies or even behavioral issues, in which case your best option is to make an appointment with a veterinarian. We have 4 house cats. One female, 3 Males. One male Captain is almost 9 years old. He weighs 13 pounds. He has spots on his back that feels like scabs. They are red. He has hair loss on his back and tail. He bites at his back alot. The female Reese weighs about 5 pounds is very thin, is about 7 years old has always been thin. She has hair loss on the back of the legs and tail. Looks to be getting thinner. No spots on back. The other two males seem fine. no hair loss or weight loss. Both are good size cats. I’m afraid the list of potential diseases that could be causing your cats’ skin problems is very long. I do worry that whatever is going on, it could be contagious since two of your four cats seem to be affected. Of course, they may be dealing with completely separate problems, but if they were my patients I’d first rule out the contagious diseases on my list. This is how I would work up your cats. Your veterinarian might have a different approach, but all that matters is that the bases are all covered. First a physical exam, and then, unless the answer is obvious (e.g., fleas), I’d move on to a skin scraping to look for mites, skin cytology to check for infection, and then a fungal culture for ringworm. The test for ringworm can take two or three weeks to complete, so while we were waiting for the results I would treat for anything that I diagnosed with the other tests, maybe prescribe a broad spectrum parasiticide like Revolution to deal with some of the mites that can be hard to find on skin scrapings, and pursue any other leads that I might have. If the fungal culture came back negative and the cats were still not better, we’d have to consider additional diagnostic tests (e.g., skin biopsies or a hypoallergenic food trial).